An ultraviolet image of a solar flare captured by NASA’s Solar Dynamics Observatory (Credits: NASA). 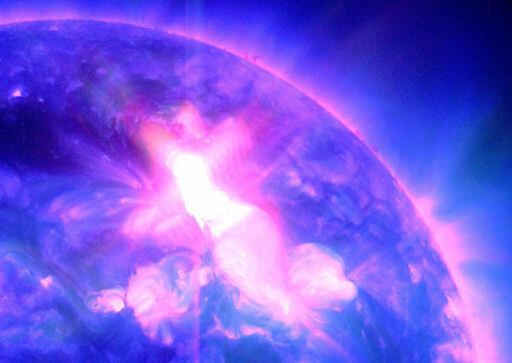 Heading into the 2013 solar maximum, more companies are realizing the impact that space weather phenomena such as coronal mass ejections can have on their operations. Some see this as a business opportunity: development of targeted space weather forecasting for commercial clients. It was a transformation that occurred decades ago for terrestrial weather. Companies like AccuWeather, which formed in 1962, provide paying customers with regular updates on impending weather in specific regions using public data from the US Weather Service. Airliners, power companies, and satellite operators would be prime targets for customized space weather forecasting since they are most severely and commonly affected by solar particle events. Currently the US Space Weather Prediction Center (SWPC) provides subscribers with weather alert notifications. Those subscribers jumped from 5,000 in 2007 to 20,000 in 2011. The topic of targeted space weather forecasting came up for discussion at a workshop hosted by SWPC and NOAA, the US National Oceanic and Atmospheric Administration, according to a report in the journal Nature. Terry Onsager, a physicist at SWPC, highlighted the value that could be added to current alerts if they were customized for specific parties. The susceptibility of a utility company, for instance, can change based on the characteristics of a particular geomagnetic storm, the orientation of its power lines, and power demands at the time, pointed out Onsager. “You can’t have the SWPC calling every electrical utility in the country every time there is a space weather event,” said former NOAA administrator Conrad Lautenbacher, stressing the natural division between public data and private product.